The Polar X-Plorer roller coaster at Legoland Billund in Denmark will take riders around a snowcapped mountain and under a frozen waterfall before sending them crashing through an ice-covered lake. Themed to look like a ski mobile, the free-fall drop coaster will serve as the centerpiece of a new $13-million Polar Land themed area set to debut at the theme park in May. The 70-foot-tall Zierer family coaster will reach a top speed of 40 mph as riders navigate high-banked turns and camelback hills while zipping past Arctic animals built with Lego bricks. Inside the mountain, Polar X-Plorer will come to a sudden stop and the train will drop 15 feet through a simulated crack in the ice, similar to the free-fall drop on the Thirteen coaster at Alton Towers in England. After the drop, the coaster will slow down to allow riders to view a first-of-its-kind live penguin display. The addition of the 3-acre Polar Land-themed area marks the largest and most expensive expansion in the history of the flagship park in the Legoland chain. Polar Land will also include a dine-with-the-penguins restaurant allowing diners up-close animal encounters. As part of the expansion, Legoland Billund will re-theme the existing Power Builder ride as the Polar Pilot School flight simulator, allowing riders to program movements on the robotic-arm ride. The theme park industry has seen a recent spate of Arctic-themed attractions. 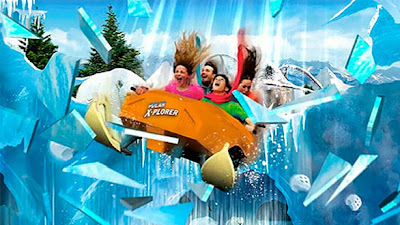 Ocean Park in Hong Kong plans to debut the Polar Adventure-themed land in 2012 with an Arctic Blast coaster while SeaWorld Orlando in Florida just announced plans to add an Antarctica-themed land in 2013.